Sometimes, a single stage blower isn’t big enough to get the job done, while most two-stage blowers are overkill. Honda’s HSS724 two-stage snowblowers are designed to fill the niche between these extremes, offering enough power for residential and minor commercial work while including features normally found only in the largest snow moving equipment. These snow blowers are powered by a 198cc Honda GX200. This engine is a staple of the commercial outdoor equipment market, known for unparalleled reliability and easy starting, even in extreme cold. In this application, only the front of the engine is covered, shielding it from ice and snow while retaining easy access to service points. The gas tank is fitted with a top-mounted fuel gauge and an extra large gas cap designed to be easy to remove when wearing gloves. Both the HSS724AWD and ATD have an electric starter that is powered by an onboard battery, eliminating the need for an extension cord. All models include an LED headlight. These snowblowers can sweep up a strip of snow that’s up to 23.8 inches wide and 21.7 inches tall at a rate of 1,500 lbs. per minute. This power is paired with a serrated main auger busts through ice and heavy snow, helping the HSS724 tackle ground cover that will stop most other blowers. This auger rides on greaseable bearings for long-term durability and has offset shear pins to prevent damage if there’s a jam. Reversible skid shoes protect the bottom edge of the auger housing, while a chute clearing tool clips into the side of the snowblower cover for quick, safe unclogging. The second auger pushes snow through the chute hard enough to throw it up to 49 feet away. The chute uses an electric joystick control for angle and pitch and has 198 degrees of rotation. The HSS724AW and AWD ride on 14-inch pneumatic tires that have a new tread pattern designed for better grip on snow and slick pavement, making them a great choice for most users. The HSS724AT and ATD use a track drive system that is ideal for use on difficult surface terrain and commercial flat roofs. The rubber tracks provide added grip on hills and inclines, uneven surfaces, icy conditions and heavily packed snow. These models also allow the height of the auger to be adjusted, digging into hard pack snow instead of driving over it. All versions of the HSS724 come with a hydrostatic drive system that has infinitely variable speed control, letting you get the right rate of snow removal to get the job done quickly without bogging down. Drive to each wheel can be engaged independently using a set of grips on the handles, helping to steer the snowblower by shutting off power to the inner wheel. Once the snowblower is in position, the grips can be locked together, allowing one hand to control drive engagement while the other is free to operate other controls. When you need to transport the snowblower, closing both grips puts the drive system in neutral so it’s easy to roll. Both the hydrostatic drive and throttle are adjustable from the handle-mounted controls, letting you ease off the engine for lower fuel consumption when moving light snow. Aside from wear items like shear pins and belts, Honda covers the snowblower and engine for three years of both residential and commercial use. Whether you need some spare shear pins or it’s time to do major repairs to your Honda snowblower, you can get everything you need from www.hondalawnparts.com. We’re a certified Honda Power Equipment dealer, which lets us offer the full line of OEM parts for Honda equipment and the engines that power them. Our site can show you factory descriptions and diagrams for the parts of your model, making it easy to find exactly what you need. We ship to both the U.S. and Canada. 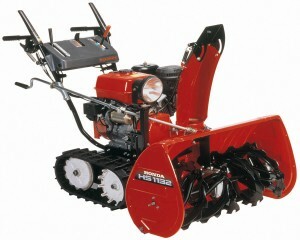 Honda may make large commercial quality snowblowers, but that doesn’t mean they’ve left the residential market behind. The HS720AA and HS720AS single stage snowblowers deliver the innovation and reliability you expect from a Honda product. 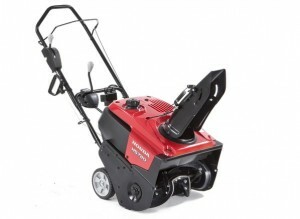 These models have a maximum 20-inch clearing width and can handle snow up to 12 inches deep. More importantly, these models can move up to 1,800 lbs. of snow per minute, which is up to four times the rate of similarly sized equipment in this segment. This lets the snowblower use more of its capacity with each pass, even when picking up dense snow, saving significant time on jobs. Drive systems are heavy and expensive, so to keep costs and weight down, Honda came up with a novel solution to provide self-propulsion. The auger blades have rubber paddles mounted on them that sweep up the snow, then grip the ground as the roll pass, pulling the snowblower forward. While it doesn’t completely eliminate pushing, it decreases the force to move the snowblower significantly. Turning is easy, too, thanks to a weight of just 89 lbs. for the AA and 93 lbs. for the AS. That’s about the same as a basic push mower. The auger is surrounded by a metal housing, while a plastic housing protects the engine and other components from snow and ice. Both models are powered by Honda’s own GC190, a popular engine for everything from pressure washers to agricultural equipment. It comes with an automatic decompression system to make the engine easier to turn over for quick starts. Go for the AS and you’ll get a 120-volt electric starter. Just plug the box on the handle into a three-prong extension cable and push the button, and an electric motor will start the engine for you. If there’s no power access handy, the engine can still be pull started. The single auger can push snow through the chute to drop it at a distance of up to 33 feet. This chute uses Honda’s Snow Director, allowing pitch and angle to be operated using two handle-mounted levers while in operation so you can keep the snow going exactly where you need it without having to stop to make adjustments. Controls and service points are easy to access. The ignition switch, choke, starter grip, dipstick and oil drain plug are all located on the rear of the unit, while the spark plug and fuel tank can be accessed from the top. All controls are oversized to be easy to operate while wearing gloves. Honda covers the entire snowblower including the engine for two years of residential use or three months of commercial use. Whether you need to keep some shear pins and belts on hand or make a few repairs to your Honda snowblower, you can find everything you need at www.hondalawnparts.com. We offer the full line of OEM Honda Power Equipment parts, and we can ship these parts to any address in the U.S. and Canada. Not quite sure what you need? Our site can find parts based on your model and serial number and will show you factory descriptions and parts diagrams so you know exactly what you’re ordering.